An amazing book is now off the press with the title "Efes Biltecha Goaleinu", published by the Natruna organization, which works for the public benefit by publicizing true Jewish faith, the true Torah position of our holy rabbis regarding the prohibition of founding and maintaining the Zionist state. The book is a wondrous collection of quotations from other books on the subject of the foundations of our faith, exile, redemption from heaven, and the subject of settling in Eretz Yisroel. For several years already, the Natruna organization has merited to enlighten the eyes of thousands of Jews from various circles around the world, by publicizing the Torah view in various ways to ignorant people because due to the confusion of the minds and blurring of the boundaries that occurs in our time, the Jewish masses are unaware of the foundations of faith that Jews possessed in all past generations, that "we have no other redeemer besides G-d." It is impossible that any salvation can come to Jews through their own power, only when Hashem Yisborach Himself saves us, with the coming of moshiach. The Zionists have convinced the Jewish people that they can "liquidate the diaspora" of the Jewish people, and with human power they can found a Jewish government, and that will solve the exilic problems of the Jewish people. The efforts of the Satan succeeded; the Zionists succeeded 60 years ago in founding a government in Eretz Yisroel, and they had successes in their wars, defeating their Arab neighbors. They succeeded in establishing a Jewish state in the Middle East, thus misleading the greater part of the Jewish people. The greatest confusion of the minds was created by the religious parties, Mizrachi and Agudath Israel, which joined the Zionist government. They became members of the heretical government, their leaders blurred the minds of the Chareidi masses, making it seem as if the foundation of the state came through Divine Providence, and the military victories were miracles from Heaven, which would then show that it is G-d's will that the Zionist state should exist, G-d forbid. Despite the fact that the state caused myriads of Jews to cease to keep the Torah, due to the confusion of the minds the fundamental foundations of our faith went completely forgotten, foundation that the Jewish people had from their earliest beginnings, and throughout the time when we were exiled from our land, that "because of our sins we were exiled from our land." And we cannot come back to the land until we repent and merit the coming of Eliyahu and moshiach. Jews always believed that the history of the Jewish people is controlled only by G-d Himself: He led us into exile and only He will redeem us, as Hashem Yisborach said to Avraham our ancestor, "Know well that your seed will be strangers in a land not their own" (Bereishis 15:13). And, as the Midrash elaborates, "Know that I subjugate them; know that I will redeem them." The matter of exile and redemption were never entrusted to any human hands, for "not through their sword will they inherit the land" (Tehillim 44:4). Jews do not get Eretz Yisroel through their own power. When it was the will of Hashem Yisborach to give us Eretz Yisroel, He gave it to us with open miracles and wonders; and when we sinned, He took the land away from us and gave it into the hands of the gentiles. He gave the rule of the land to other nations, until we repent. As Hashem Yisborach promised us in the holy Torah, as soon as we repent He will redeem us from exile and bring us back to Eretz Yisroel through moshiach with miracles and wonders akin to the miracles of the Exodus from Egypt. Even the religious circles who understood that we cannot see the state as "the beginning of the redemption" or "the beginning of the ingathering of the exiles" still saw it as a "positive salvation for the Jewish people, after the bitter suffering the Jews experienced during the Second World War". And from this sprouted the tragic mistake, by some of those rabbis who permitted participation in the Knesset elections, that religious parties as well should be members of the Zionist government, to be among the 120 members of Knesset together with the worst heretics, who openly declared that they have no part in Hashem and His Torah. This brought about that Chareidi Jews also bear some of the terrible responsibility for the rebellion against G-d by the sinful state. A good part of the gedolim who permitted participation in the elections did so only as the lesser of two evils, because the leaders of their parties succeeded in convincing them that only by sitting in the Knesset could they save Torah Jewry from the evil decrees of those who wished to uproot the Torah. Those gedolim certainly did not mean by so doing to give their approval to the existence of the state, but most of the Jewish masses did understand it as approval, as if by permitting participation in the Knesset the gedolim confirmed that the foundation of the state was a positive thing, something for Jews to be happy about, since it came through Divine Providence. This furthered the confusion of the minds in the Jewish world. Myriads of Chareidi Jews were drawn after the Zionist heresy, until the true foundations of the faith regarding exile and redemption were practically forgotten. Just as Avraham our ancestor was the only one in his generation to repudiate idol-worship, the Satmar Rebbe was the only one in his generation who never ceased to alarm the Jewish people through the spoken and written word both before and after the state unfortunately became a fact that the establishment of the state is not only not a salvation for the Jewish people, but is the greatest misfortune for the Jewish people. For the very existence of the state even if it were to be run based on the Torah is forbidden by the serious and fearful prohibition to violate the oaths of exile. It is a denial of the Divine nature of the decree of exile and subjugation to the gentile nations, a denial of the belief in the coming of moshiach and a Heavenly redemption after repentance. And any admission, however small, to the state's existence is legally considered as an admission to idolatry and heresy, which are among the most severe sins in the Torah, sins for which a Jew must give his life rather than transgress. The Rebbe wrote about these ideas at length in his holy works, Vayoel Moshe, Al Hageulah V'al Hatemurah and Divrei Yoel. He brought countless proofs from the Torah and Prophets, from statements of the Talmudic Sages, the works of the Rishonim and Acharonim. He explained that the Zionist state is the greatest rebellion against Hashem and His Torah. But the leaders of the religious parties led the masses astray, making them think that the Rebbe's opinion was a lone opinion, as if the Satmar Rav was the only one who held that Jews may not have a state before the coming of moshiach, but all the other gedolei yisroel held that the founding of the state was a positive thing. The religious newspapers confused the minds by falsely relating verses of the Torah to the state, and they quoted falsified statements of gedolim and righteous men, making it seem that those gedolim saw the state as a salvation after the Second World War, so that "Jews should have somewhere to lay down their head" until the coming of moshiach, to live in peace. They also claimed that all the mass immigrations from the diaspora were part of the promised ingathering of the exiles, to the point that even the mass immigration of Yemenite Jewry was seen by them as a sign of the redemption, despite the fact that the Zionists used their absorption of the Yemenite Jews to make them irreligious, and robbed them of their children. Unfortunately, the Jewish world today is overflowing with newspapers, magazines, stories and other books that contain false quotations from gedolim that border on real heresy, G-d forbid. This continues to confuse people's minds to this day, not allowing Jews to break away from the Zionist idolatry, even today when everyone sees the state's failure spiritually and physically, and the terrible bloodshed that the state brings and continues to bring. The confusion of the religious Jewish world continues even at a time when the secular Zionist leaders feel compelled, for the sake of peace, to give up the occupied territories to the Arabs for them to found a Palestinian state. Since the state is against the will of G-d, it is impossible for it to have ultimate success, as it says in the Torah (Bamidbar 14:41), "Why do you transgress the word of Hashem? It will not succeed." And the Ibn Ezra says that no transgression of the word of Hashem can be successful. Since the entire establishment of the state was a Satanic act, the end is bitter. As Rabbeinu Gershom writes (Tamid 32a): "The Satan was victorious: the Satan leads the wicked astray and gives them a redemption, and in the end he brings them down to Gehinom." Despite all this, the greatest confusion of the minds still prevails in the Chareidi world, promulgated by the newspapers and books. To this day, an intensive propaganda campaign for emigration to the Zionist state goes on among the religious masses in various countries. Thousands of Jews annually in America, France and other countries are talked into emigrating to the Zionist state by the organization Nefesh B'Nefesh, which focuses on religious Jews who can accept the Zionist propaganda concerning the mitzvah of settling in Eretz Yisroel. The religious parties today have been transformed into the most extreme militants, worse than the secular Zionists. They are ready to fight for Zionist sovereignty, refusing to give up Zionist sovereignty over any part of the land. The religious masses today are simply ignorant about the fundamental foundations of faith of the Jewish people, because their teachers and parents never taught them the pure faith that Jews in past generations implanted in their children, that only G-d can help us, only He will redeem us from exile, and that it is impossible that Jews should take for themselves a land with human power before the coming of moshiach. As history has taught us, all false, human redemptions ended with bitter disappointment. And during exile, Jews must accept the yoke of exile lovingly, not rebelling against the nations. All these simple things are almost forgotten in this generation, when ignorance of the Torah prevails. There are great Torah scholars who are trained in many areas of the Torah, in the Talmud and the halachic codes, but have no concept of the simple fundamentals of Judaism, things that every simple Jew once knew. "Blessed is G-d Who entrusted His world to guardians!" (Avodah Zarah 40b) Great thanks is due to the Natruna organization, which has occupied itself already for several years with this activity, to spread the Torah view among ignorant Jews in America and other countries. Through them, thousands of Jews have become aware of the simple foundations of the faith, that only Hashem Yisborach is the exiler and the redeemer, and that the establishment of the state is the greatest misfortune that ever befell the Jewish people. It has unfortunately transformed Eretz Yisroel into the most dangerous place in the world, physically and spiritually. Natruna teaches Jews not to have any connection with the Zionist state and emigration campaigns. Thousands of American Jews have opened their eyes to see the truth, from simple verses of the Torah, Prophets and Writings, statements of the Sages, works of the Rishonim and Acharonim, and words of the gedolim from all circles against the Zionist heresy. Natruna founded a forum in the American Jewish street to counteract the propaganda for aliyah (emigration to the Zionist state), especially that spread by the Zionist organization Nefesh B'Nefesh. Natruna placed literature in synagogues containing statements by the very same rabbis respected by people in those synagogues, until many religious Jews in America began to see that the religious Zionists had lied to them about the true meaning of the verses of the Torah (just as the Christian Zionists, the Evangelists, falsify the meaning of the verses of the Torah and the Prophets) saying that they refer to the Zionist state, contrary to the true faith taught to us by the Sages that Jews may not take Eretz Yisroel with their own power, only when Hashem Yisborach gives it to us when moshiach comes. During their holy work to publicize the word of G-d, the leaders of the Natruna organization decided to put together the book "Efes Biltecha Goaleinu", assembling in book form dozens of verses from the Torah and Prophets with the classic commentators, as well as countless statements of the Talmudic Sages, where the foundations of the faith are made clear, that exile and redemption depend on G-d, and only G-d can redeem us. Any redemption or state before the time is the greatest danger for the Jewish people. The book would open the eyes of the deceived, naïve masses, so that everyone could see that the "position" of the Satmar Rebbe was not a lone opinion, as the Zionists claimed, but was always a fundamental teaching among the Jewish people. Natruna also saw the importance of gathering all the clear statements of gedolim from past generations from all countries, from Eretz Yisroel, Poland, Lithuania, Hungary, Germany, Russia and other countries, the greatest Ashkenazim and Sephardim, the greatest Chassidim and Misnagdim, who lived in the early period of Zionism. All of these saw the Zionist path as a path of heresy, because it involved transgressing the oaths by taking the land with human power before the coming of moshiach, and said that this is an absolute prohibition, even if the state were to be run according to the Torah. This is the greatest evidence to show that until this lowly generation, this was the position of all true Jewish rabbinic leaders. Only in this generation of ignorance was the Torah view made to be forgotten by the leaders of the parties. To the Rebbe, our master, the holy gaon shlita, peace and blessing. Every day I have thought of going to meet you, but I see that, unfortunately, I am very weak, and especially any sort of travel weakens my body greatly. I have already tried to begin the holy work, which you asked me to do for the sake of the continuity of the holy Torah. But I realize that a craftsman cannot work without tools, and I cannot do the work without looking in the books on this subject in general, and particularly in the posters containing statements from our holy and righteous rabbis. And therefore I have to spend two or three days in the place where these are stored. What can I do? I have no strength to do this. If there perhaps be found a man of understanding who could do this, then without a vow I am willing to arrange the material to the best of my ability. Who is like the sage, who understands the meaning of things, the right time to say things? There is a time to be silent and a time to speak who understands this better than you? Whatever you command, I shall do." This holy work was taken on by the Natruna organization, to collect the dozens of verses from the Torah and Prophets with the classic commentators, and all statements of the Talmudic Sages, Rishonim and Acharonim dealing with these subjects. They gathered these in the book Efes Biltecha Goaleinu. There one can see clearly that the prohibition of the oaths in Kesubos (111a) is not, as the scoffers of the generation say, an "Agadta". It is one of the fundamentals of the Jewish faith, that Hashem Yisborach sent us into exile and we are not allowed to kick back against His decree, to free ourselves with our own power, and this is the greatest danger for the Jewish people. 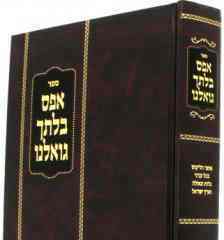 The book quotes many works of Rishonim and Acharonim that speak halachically about the severity of transgressing the oaths. One sees that this is not the lone position of the Satmar Rebbe, but rather the position of the holy Torah, and this is how all previous Torah giants held. The book Efes Biltecha Goaleinu consists of nine sections. The first section "Bearing Your Burden", containing ten chapters, brings out from the verses of the Torah and statements of the Sages the decree of exile and the decree of subjugation to the gentile nations, the reasons for the exile and its benefits, the importance of bearing the yoke of exile, the great benefit of Jews remaining in the diaspora until the coming of moshiach, the benefit of Jews being scattered in the four corners of the world, the great reward awaiting Jews who hope to G-d during exile, despite the great length of the exile. "The believer does not hurry" to the end. We believe faithfully in the providence of G-d during exile: "Great is the power of the Shepherd Who saves them." Therefore, Jews in exile act humbly toward the nations and fulfill the command of Yirmiyah the prophet: "Seek the peace of the city where I have exiled you." In the second section, "Not By Might and Not By Power", the prohibition to force the end of exile and the prohibition to rebel against the nations are explained. It is made clear that we are forbidden to force the end even with permission from the nations. Also quoted are many halachic works that bring the Three Oaths as binding law. It is shown that a Jewish government before the coming of moshiach delays the coming of moshiach. The third section, "And a Redeemer Will Come to Zion, to Those Who Repent", verses and works are quoted to show that only G-d put us into exile and only He will redeem us. The future redemption will take place with wonders and miracles, not naturally. Jews cannot be redeemed without first repenting. The fourth section, "They Did Not Believe in G-d, Nor Did They Trust in His Deliverance" explains the depth of the heresy of Zionism. It is denial of the belief in Divine Providence, denial of the coming of moshiach, denial of the Torah's promise that "Israel will only be redeemed through repentance," it is a rebellion against the decree of exile, and it leads to complete denial of G-d. Since Zionism is an organization founded in order to commit a public sin, it is considered a rebellion against G-d. A Jewish government with non-Jewish laws is a denial of the entire Torah. In the fifth section, "And It Will Not Succeed" verses and quotations from the Zohar, Chazal and other works are brought to show that the end of the sinful state will be bitter disappointment. It is impossible that a Jewish government during exile should last. Also explained is the great obligation today to protest against the state and publicize before the gentile world that the Zionists do not represent the Jewish people. We are obligated to pray that the state come to an end right away, without damage to human life. Only after the state is gone can we merit the coming of moshiach. The sixth section, "Who Can Ascend the Mount of G-d", the basic rules of living in Eretz Yisroel during exile are laid down. Also brought is the opinion of many gedolim regarding living in Eretz Yisroel after the time of the first Zionist colonists, the Chovevei Zion, who desecrated the holiness of the land, and the question of living there after the establishment of the state, when there is danger to both soul and body. The seventh section, "They Will Be Purified", explains the great danger to one who sins, G-d forbid, in Eretz Yisroel, since Eretz Yisroel spits out sinners. The eighth section, "Spoken and Written Words", is a collection of letters and poster statements from many gedolim from all circles against Zionism, dating back to the first years of Zionism, more than 100 years ago. These letters are printed in the books "Daas Harabbanim" and "Ohr Layesharim" and other posters, in which we see clearly the Torah view of all these rabbis against the establishment of a state by human power. Also quoted are dozens of statements of gedolim from all lands: Lithuania, Poland, Russia, Germany, Hungary and Eretz Yisroel, who wrote against the Zionists, Mizrachists and Agudists, and particularly against the heretical idea of founding a Jewish state before the coming of moshiach. Historic documents from over a hundred years ago are quoted, for example, the ruling of rabbis of Paris and London against a plan to found a Jewish state in an American colony, which was seen as a denial of the coming of moshiach and a transgression of the oaths. In the ninth section, "They Cannot Sleep Until They Do Harm" sharp statements are quoted from gedolim regarding the great danger that Zionism brings upon the Jewish people. By aggravating the gentile nations, they give rise to anti-Semitism and cause bloodshed. They caused the destruction of six million Jews during the Second World War, and to this day their actions create anti-Semitism, and we are obligated to fight them with all our power. Whoever leafs through the pages of Efes Biltecha Goaleinu can no longer have any doubts about what the true Torah view of past gedolim was regarding the Zionist state. This is the simple foundations of faith that are stated in all verses of the Torah and Prophets, that the hopes of the Jewish people hang only on a Heavenly redemption, which will materialize when moshiach comes. All human redemptions bring only misfortunes upon the Jewish people, physical and spiritual. Having the smallest connection with Zionism is the most severe sin, and a denial of the holy Torah. The fundamentals of faith are the most important things a Jew must learn, but they are going by the wayside in today's generation. The learners learn through all areas of the Torah, except for the area of true faith which is relevant to our situation today. Hopefully, the book Efes Biltecha Goaleinu will help to explain to the masses the fundamentals of true faith. In the merit of publicizing the faith, we hope to merit the true redemption. As the Sages say (Tanchuma Beshalach 9), "The Jewish people will be redeemed only through the merit of faith." By reviewing the subject of faith, we come to the true faith, as it says (Tehillim 116:10), "I believed, for I spoke." In the merit of faith, we hope to see the true redemption of Israel and their happiness, when the glory of Heaven is revealed upon us, with the coming of moshiach, soon in our days, amein.